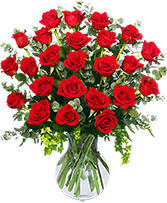 Express your love with this magnificent display of 2 dozen roses!! When the message needs to be clear, send beautiful red roses from HIGHLAND FLOWERS. Nothing says "be my Valentine" better than this ever popular display of red roses, Godiva chocolates and a soft and cuddly plush bear. The small bundle, shown, has a 4 piece box of Godiva, medium has the 8 piece and the premium bundle includes our largest box of Godiva chocolates! 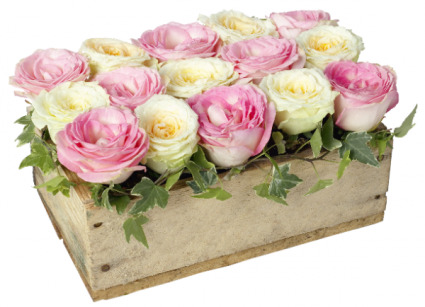 WOW them with breathtaking roses from HIGHLAND FLOWERS! 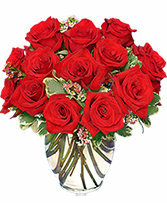 !A dozen and a half classic red roses highlighted with colorful, scented finishing touch accents. For flowers that will inspire the senses, order online from our website 24/7 or call our shop direct.